When it comes to car themed beds, girls are often overlooked. It’s generally perceived that girls are less interested in motoring themed beds. If you’ve been searching far and wide for a pretty pink racing car bed for your little one, you’ll be pleased to hear that Little Tikes have another great option in the form of their Little Tikes Princess Pink Toddler Roadster Bed. The design of the bed is a pretty much standard racing car, but the bed also uses a pretty pink exterior in order to make it even more attractive to your little one. There’s a lot more to know about this little bed, so we’ve compiled the advantages and disadvantages of the product, to ultimately decide if it’s worth the money or not. If you’re looking for the perfect racing car themed bed for your little girl, it’d be well worth your time to read on into our full review. We’ll start with the advantages and there’s a lot of them when it comes to this product. 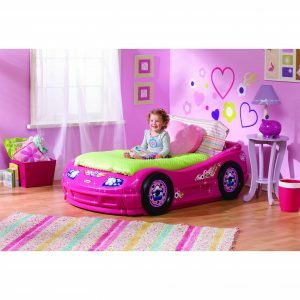 The biggest advantage being that it’s a racing car themed bed designed for girls. 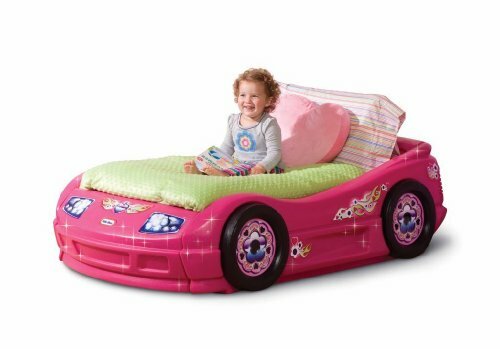 As we’ve already mentioned, racing car themed beds don’t tend to largely be targeted at little girls, so it’s nice to have seen Little Tikes take that route with this product. The pretty pink exterior of the bed also means that your motor loving little girl won’t have to put up with a bed that has clearly been designed for boys. We’re also pleased to confirm that the bed has been constructed pretty well too. It’s worth noting that this is a plastic based bed, but it does use solid durable construction from a brand that are well trusted when it comes to kid’s furniture. The plastic exterior also means that you’ll be able to wipe off the product and remove any stains much easier than you would be able to with a wooden variation of a product of this type. Another great little feature that we love about this bed and something that should save you some cash is the fact that it works with any standard US crib mattress. Mattresses that measure at around 52″ x 28″ x 6″ should easily fit within the bed. This means that you won’t have to spend extra money on new mattress for your crib. There may be a lot of reasons why you should invest in this bed, but there’s also a few disadvantages to the product too. The first of those is the price. It comes in at just under $300, which is a pretty expensive price point when you consider that the bed uses only plastic materials. We’d expect that price for a bed that uses wood and other construction materials, but we feel the price is a little expensive for plastic. If you can deal with the price of this product, it might still be worth considering what mattress you intend to use with the bed. As aforementioned, the bed is designed to work with the standard US crib mattress and the bed can actually support other mattress sizes. However, you’ll need to supply your own mattress support and plywood if you plan on making any adjustments. With the price of this product taken into consideration, it would have been nice to see Little Tikes include these extras. In conclusion, we suggest taking the advantages and disadvantages of this product into consideration before deciding whether or not to buy the Little Tikes Princess Pink Toddler Roadster Bed for your little one.